As a venue Kettle’s yard has always had a strong relationship with abstraction, this dates right back to the arrival of Jim Ede in 1957 and his seminal collection of early British abstraction. Having been fed on this diet as a child, I couldn’t resist the prospect of viewing a contemporary abstract show in this veritable crucible of quieter abstract art. By quieter, I refer to the softer canon of Nicholson, Hepworth et al as opposed to their more bullish, hell raising American counterparts. And by and large this historically frame of quieter abstraction sits well with ‘the long dark’. There are 9 nine artists in this show and that’s for my money about as many as any a group show wants to include in order to attempt any meaningful cohesion. Simon Bill presents a series of shield shaped paintings on plywood sheets. They float proud of the wall projected on bog standard chunky polystyrene, rejecting the frame and the rectangular picture plane. His short quirky titles act more as labels rather than pointers. The pictures are chirpy, lively and playful in a good sort of way. They are skillfully un-labored and made with an evident sense of quick decision making. They contain cross cultural referents, with a curious kind of ethic feel. One titled canoe reminded me more of a series grey inverted missiles. Others suggested quick renderings of leaves or birds. They are convincing and hold a strong sense of their own autonomy. In the wall painted work of Maria Loboda stronger links with a historically couched modernist influence come over. Working directly on the wall, thin washes of geometric colour pick out geometric intersecting shapes and lift up the underlying texture of the rustic plaster render to good effect. This is soft touch abstraction of a friendly kind, in way that is redolent of Nicholson. Kalin Lindena also produced site located work, but this was more overt in its architectural locus. Coloured tissue paper scraps (an ephemeral media at the best of time), delineated a doorway intersecting two chambers in the gallery, a curious and likeable paradox and one of the best uses of tissue paper I’ve seen in a long time. However where Lindena really begins to motor is in her delightful glass flags piece. In this work you get the joyful visual paradox of large coloured drooping glass heraldic style flags hanging in sequence, high above head height, flopping precariously down from their angled poles they appear to be secured only by crudely stuck bits of felt and old sweaters. This engagement with apparently low craft is evident across many of the works on show. Alexandra Bircken pushes the edge of naff with her assemblage of sticks; a fragment from a hobbyist sampler, a kids glove, some wool and plaited hair, it is precariously teetering on the edge of crap. Another work by him reminds me of some of the dodgy things made in the mid 1970s hey day of hobby crafts, the great era of curve stitching. These odd knitted stretch tapestry affairs are far from eye candy, and as such worth looking at. More highly discernable formal skill can be seen in the paintings of Bernd Ribbeck who shows among other works a series of small geometric abstractions which utilize symmetry of form and juxtaposition of colour to create a powerful visual impact that punches well above its domestic scale. The paint is meticulously scraped and colour placed to create a charged and dynamic resonance. They appear in part totemic and human in referent, making a significant nod (but not replication) of some serious and seminal Russian abstract art. 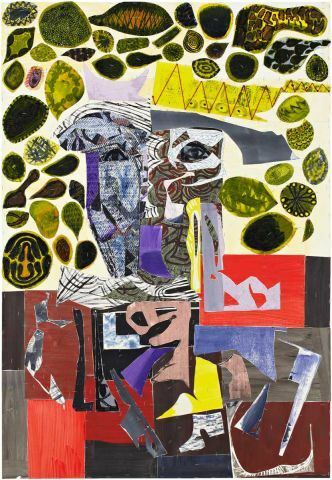 Peter Linde Busk presents among other pieces a pair of large collaged abstracts which occupy an curious aesthetic somewhere in between the mood board and the sketch book in their production methods and connotations. Were it not for an underlying formal sensibility that pulls it together this work could easily fall wide of the mark. But as it is, this work is all the more convincing because of this cusp. The obsessively scrappy assemblage using staple gunned fragments of other painted images onto canvas gives a dark, sinister edge. Among all this one could easily miss Raphael Danke’s small domestic scaled sculpture suggestive of a meticulously hand crafted russian doll. This small wooden piece comprise layer after layer of carved wooden enveloping form, suggesting sheilding hands and protection. It is very close in aesthetic to the kind of thing the great abstract cultural plagiarists of modernism would have lifted from an African trip here or a street market there, in order to create an anti classical edge to their own work. A delightful thing that would totally at home in the Ede house itself. Nicholas Byrne, takes referenced abstraction with an early Pollock-esque feel and paints it onto plexi glass to monkey around with the historic connotations whilst triggering associations with the seminal Pollock drip video. These are paintings that fight with their support, and it is this tension that very much plants them into the here and now. The painted wood and strung wool geometric sculpture of Eva Berendes, apes welded steel, constructivism. This work stands on its plinth and clearly references modernist architecturally placed sculpture, the kind dotted all around Cambridge itself. The sculpture is like a maquette for a major work for a 1960’s cathedral. Work again that juggles with the past. Overall I found this an intriguing show of generally intelligent art. A show which demanded time and an amount of art historical awareness in order to get beyond the ease of mere looking, and a show that sat well in its venue, both physically and contextually.